In just a few short days, the members of Duelly Noted will cram into a Jitney and hit the road on our annual tour! We will be performing in Rochester, NY; Southbury, CT; Simsbury, CT; and Whiteplains, NY. We will also make a stop in NYC! Stay tuned as we post photos, videos, and tweets from group members. Watch our Family Weekend performances on Youtube! Follow along as we embark on #duellytour! On Thursday, January 8, twelve members of Duelly Noted will pack into a college van and embark on our fifth annual winter tour. This year, we'll be performing in Ballston Spa, NY; Providence, RI; and Essex Junction, VT. This week, we're heading on a four-day tour in New York State and Vermont. We'll be performing in several locations throughout the two states and spending some quality time bonding with friends and fellow aca-people. If you can't make it to one of our performances, keep up with us online. Follow along after the jump as we make our way from stop to stop. We'll be posting pictures, videos, and tweets from group members and fans. Co-ed a cappella group Duelly Noted is preparing for its fourth annual concert tour over Hamilton’s winter break. The four-day tour will include several performances throughout New York State and Vermont. The tour will begin on Thursday, Jan. 9, with an evening concert at Union College in Schenectady at 7:00 p.m. In addition to Duelly Noted's performance, the concert will also feature several Union ensembles as well as The Buffers, Hamilton's all male a cappella group. On Jan. 10 the singers will travel to Burlington, VT, where they will spend a few hours downtown caroling and performing outdoors for shoppers. The following day, they will perform in the hometown of Duelly Noted’s Brian Evans ’15 at First Congregational Church in Essex Junction, VT, at 1 p.m.
Duelly Noted moves on to a concert in Kingston, N.Y., the hometown of Maggie Whalen '14, on Jan. 11 at 9 p.m. at High Falls Cafe. The tour concludes with a performance in the hometown of Duelly Noted’s Gabe Mollica ’14 at the Church of Saint Anne in Garden City, N.Y., at 6:45 p.m.
Each hour-long concert highlights a range of vocal styles and choreography. Duelly Noted’s diverse repertoire often features many "oldies" including "Why Do Fools Fall In Love," "The Way You Look Tonight," and the Stevie Wonder hit "As" as well as Disney classics. The set is rounded out with several pop songs including Smash Mouth's "All Star" and "Telephone Medley," Duelly Noted's own arrangement of phone-related songs. The free performances will also help to raise money for local charities. The concert at First Congregational Church of Essex Junction will offer a collection for the local food pantry, and the show at the Church of Saint Anne will be offering a freewill collection to benefit the St. Anne's Respite Program for children with special needs and their families. Duelly Noted was founded at Hamilton in the spring of 2008 by eight first-year students. The group has since grown to 17 members representing all classes. In its first six years, Duelly Noted has performed in several unique venues including the streets of Venice, Italy. In November, the group competed against eight other area a cappella groups and took home first place at Turning Stone's Collegiate A Cappella Showdown. For more information, please visit www.duellynoted.org or contact group president Andrew Nichols ’14 by email at apnichol@hamilton.edu. Check out our new album, "FIVE"! Duelly Noted is proud to announce the release of our second album, "FIVE"! Celebrating five years of friendship, family, and perfect fifths, we could not be more excited to share this album with our fans! The album is available on iTunes, Amazon, and CDBaby, and you can even listen to us on Spotify. Hard copies are available at Hamilton College and will be for sale at the Family Weekend A Cappella concerts in the Chapel: Friday, November 1st and Saturday November 2nd at 9:30 PM. "FIVE" features some of our favorite tracks from past semesters, such as Lady Gaga's pop-anthem "Born This Way," and our ever popular take on FUN's "Some Nights." The album also showcases some fantastic senior solos, complete with Disney classics, an 80's throwback, and even a little Beyoncé. Be sure to check out the last track, "Duelly Pop" a sweet mashup of top-40 radio hits. We promise if you have half as much fun listening to "FIVE" as we had making it, you're in for an "aca-awesome" time! Duelly Noted performed in the Chapel this weekend to a packed audience of students, parents, and alumni as part of Hamilton's Fallcoming weekend festivities. A new year, a new group of Duelly babies! Follow along below (after the jump) as we make our way around the Northeast. We'll be posting pictures, videos, and tweets from group members. We are thrilled to announce that four new talented and fantastic individuals have joined Duelly Noted. They are welcomed affectionately into our family as new Duelly Babies! Please join us in welcoming and congratulating Michael Dyer '16, Brian Evans '15, Joanie Frost '16, and Katie Puccio '15. Duelly presents Orientation Week concerts! This Orientation Week, join Duelly Noted for two fun and diverse concerts! On Wednesday, August 29 at 8:00p.m. in Wellin Hall, Duelly will perform a short set in the Orientation preview concert. On Friday, August 31 at 8:00p.m. in Well Hall, Duelly will present Orientation the Musical: 4 — Dark Side Story. This fun performance will include even more songs and moves. Interested in auditioning for the group? We'll be holding auditions for interested singers on Saturday, September 1, and Sunday, September 2. Sign up for an audition time in Opus I. Come prepared with a verse and a chorus of a song (a cappella, of course!) and be ready to have some fun and be wacky! This past weekend, members of Duelly Noted returned to the Hill to perform during Hamilton's Reunion Weekend. We sang selections from our diverse repertoire at various dinners for enthusiastic alumni in reunion classes ranging from 1952 to 1992! Throughout the weekend, we had the chance to meet scores of friendly and interesting Hamiltonians. We were treated to enthralling stories of Hamilton history—singing in the shower to Simon & Garfunkel, for example—and even got to chat with the founder of The Buffers, Hamilton's oldest a cappella group (founded in 1952). We were especially proud to have the opportunity to serenade our college president, Joan Hinde Stewart, with a surprise performance of the timeless Sinatra classic "The Way You Look Tonight." Cheers to another successful Duelly weekend on the Hill! Congratulations are in order for Sarah Mandel '15 and an unnamed member, the two newest members of Duelly Noted. We're so thrilled to welcome them into the Duelly family! Members of Duelly Noted on tour in Kinnelon, N.J.
Duelly Noted has arrived back on the hill after completing our second annual concert tour over winter break! Three of the performances on the four-day tri-state tour were held in the hometowns of current members: Queensbury High School in Queensbury, N.Y., home of Madison Malone Kircher ’14; Newtown Congregational Church in Newtown, Conn., home of Andrew Nichols ’14; and Our Lady of the Magnificat Church in Kinnelon, N.J., home of Mackenzie Leavenworth ’15. We also performed in a Thursday evening concert alongside a cappella groups at Union College in Schenectady, N.Y.
Each hour-long concert highlighted a range of vocal styles and fun choreography. Duelly Noted’s diverse repertoire often features many "oldies" including "Why Do Fools Fall In Love," "The Way You Look Tonight," and "Who Loves You" as well as Disney classics "Can You Feel the Love Tonight" and "Part of Your World”. The set was rounded out with several pop songs including "Lay All Your Love on Me," "Thriller," and "Zombie Jamboree." The free performances also helped raise money for local charities. Enthusiastic audiences in Newtown and Kinnelon donated a combined amount of more than $800 in cash plus several bags of canned goods to benefit their towns' food pantries. Like to sing? Audition for Duelly! Want to audition for Duelly Noted? We're holding open auditions this Friday and Saturday in Opus I. Come ready to sing a verse and a chorus of any song (a cappella, of course! ), and be prepared to have fun and be wacky! Sign up sheets with audition times are located in Opus. Please also fill out an audition form and bring it with you to your audition. Duelly Noted takes its show on the road! 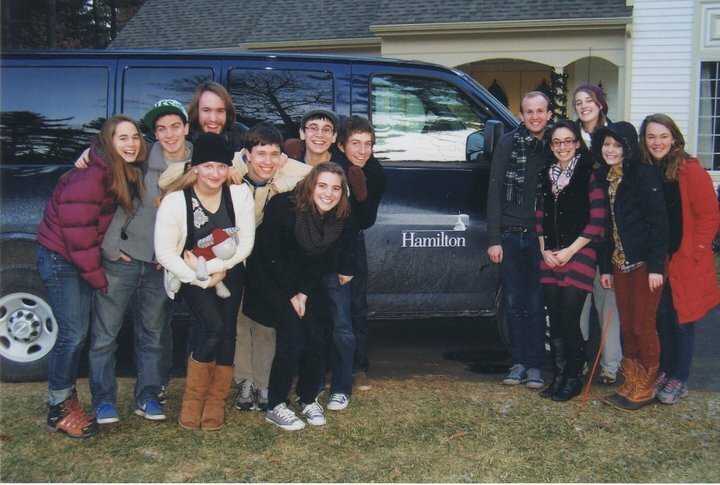 The annual Duelly Noted winter tour commences tomorrow morning as 11 of us pack into a Hamilton jitney and sing our way through the tri-state area. We first stop at Queensbury High School—alma mater of Duelly member Madison Malone Kircher '14—in Queensbury, NY on Thursday, January 5. We'll be performing at 2:00 p.m. in the auditorium, 409 Aviation Road. Next, we'll make our way to Union College in Schenectady, NY where we'll perform alongside Union a cappella groups and the Hamilton College Buffers. The concert is at 7 p.m. on Thursday, January 5, in Nott Memorial. 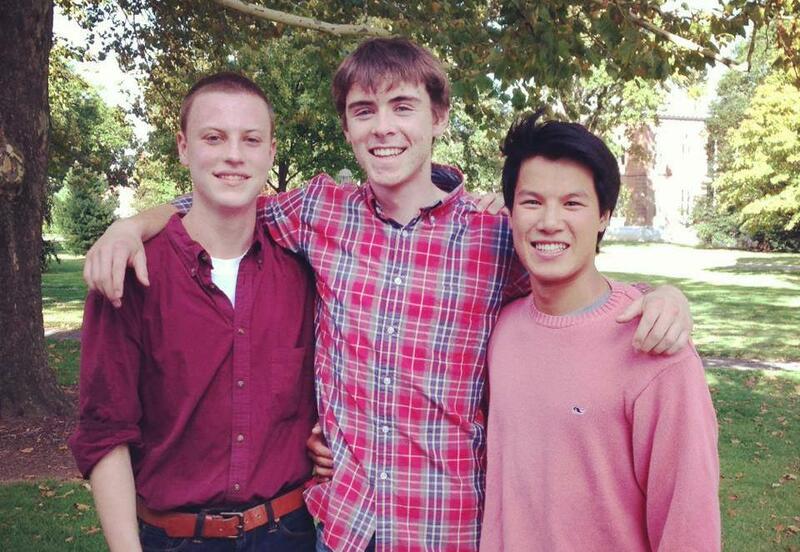 On Friday, January 6, we'll travel to Newtown, CT—hometown of Duelly member Andrew Nichols '14. We are performing at 7 p.m. at the Newtown Congregational Church, 14 West St. A freewill collection will be held to benefit the FAITH Food Pantry. Our final performance is at 7:30 p.m. at Our Lady of the Magnificat, 2 Miller Road, Kinnelon, NJ—hometown of Duelly member Mackenzie Leavenworth '15. All performances are free and will be around 45–60 minutes. Hope to see you there! "Duelly Pop" single now available! It is with great excitement that we announce the release of our latest single: Duelly Pop! After wowing audiences with this fabulous medley at Hamilton in 2010, Duelly Noted is thrilled to finally share with the world three of its favorite things: pop divas, hot mash-ups, and vocal music at its finest. Duelly Pop is now available for purchase on the iTunes Music Store, Amazon MP3, and on our own Music page.